Ask anyone what deters them from creating better eating habits and 9 times out of 10 their excuses will have to do something with the time it takes to purchase and prep healthy food. They’re technically right but in comparison to what? Feeling terrible and under performing in everything you do? Wouldn’t it make sense to make-up time you’d waste feeling awful and sluggish by learning a few easy and fast recipes that nourish your body and improve your energy? That’s my mission – to show you how cost effective and easy plant based nutrition can be. This recipe is about as simple and tasty as it gets! Although I can honestly say I feel focused and full of energy most of the time, some weeknights you get home and just want to get dinner on the table as fast as possible. 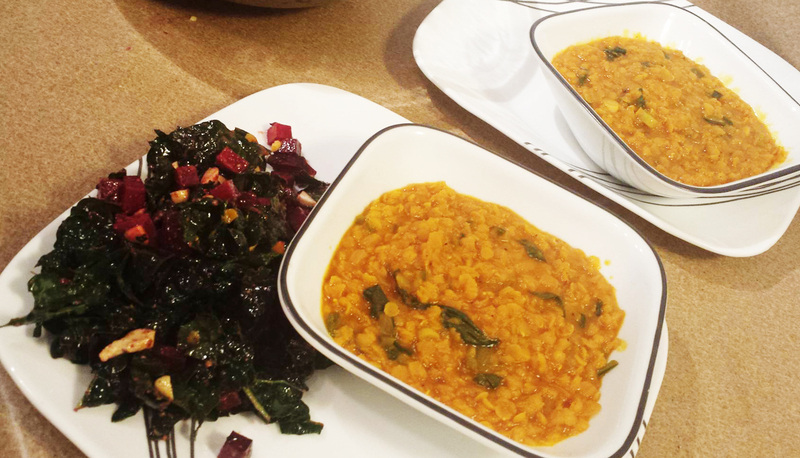 Thank goodness for red lentils. They’re a mighty little legume that cooks in just 10 mins and are often used in middle eastern and north African dishes. Lentils are packed with fiber, non-heme iron (the good stuff), folate and magnesium and are considered one of the best slow-burning carbohydrates you can consume for insulin and blood sugar control. Their texture is similar to a split pea lending themselves beautifully to a rich and hearty soup that will leave you warmed and satisfied. 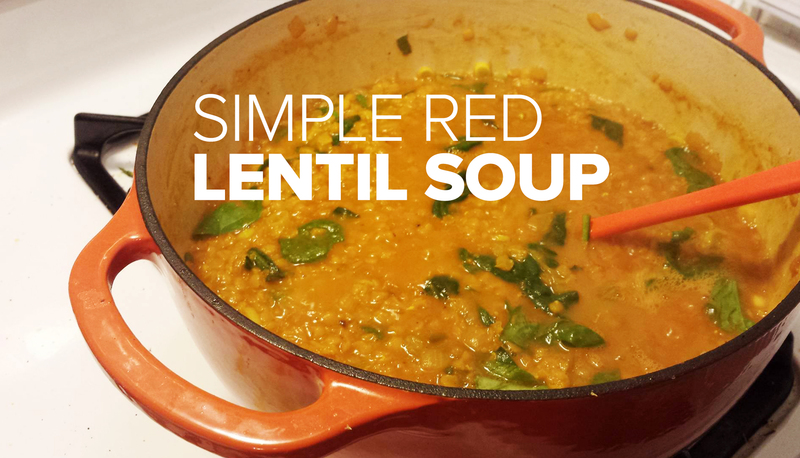 You can purchase red lentils at just about any health food store in the bulk section as well as Aldi, Trader Joe’s and most traditional grocers in the ethnic aisle. 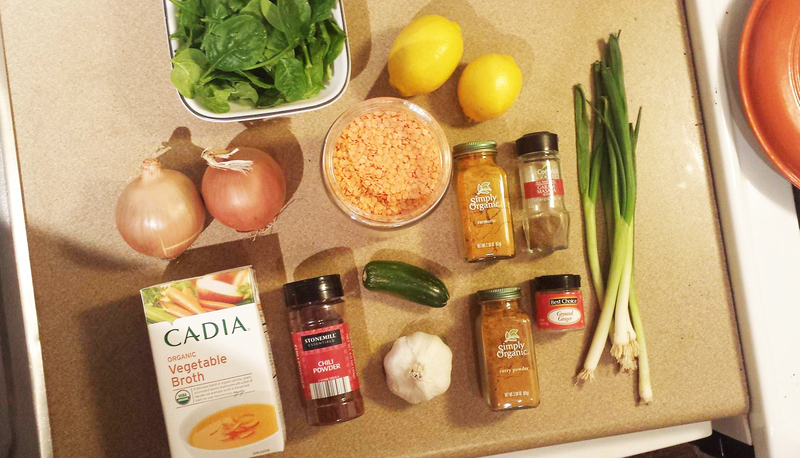 Here’s my twist on middle eastern red lentil soup. 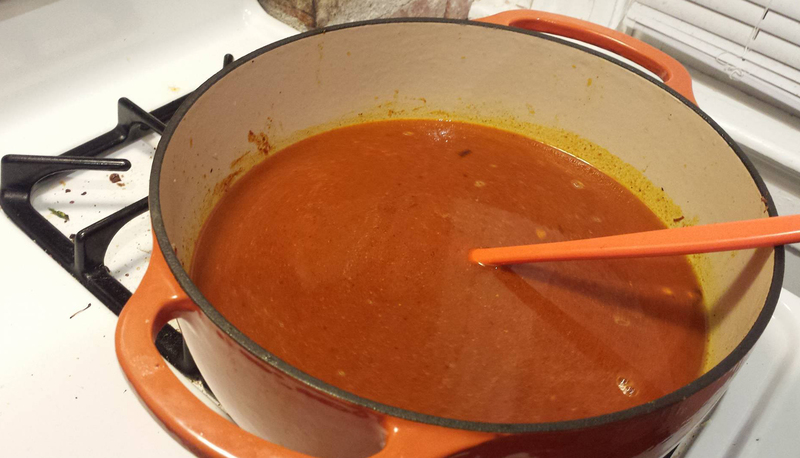 In a 4-quart dutch oven or large pot, bring your oil to medium high heat while you chop your onions and garlic. Add the onions and cook for 6 mins until they begin to brown slightly. 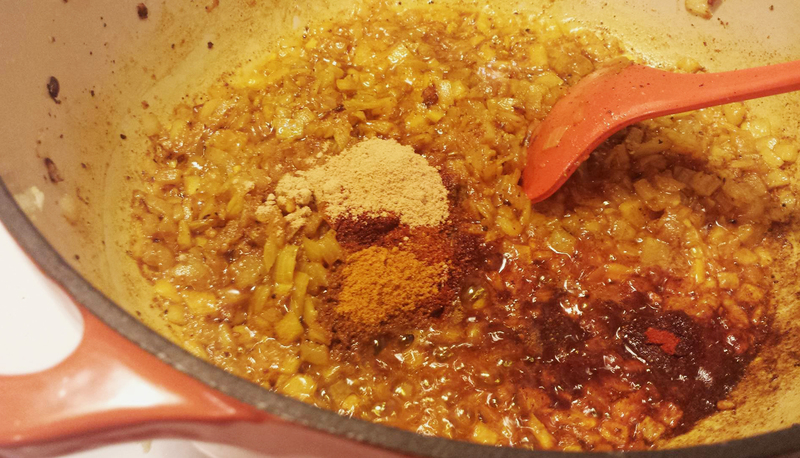 Add in your minced garlic and stir well. Cook another 2-3 mins until very fragrant. Add all your spices on top of the onions but do not stir them for a minute. Let them toast on top to protect them from burning. After they’ve sat on top of the onions for 1-2 mins, stir them in and allow them to continue to toast for another 2 mins while you stir continually. If the mixture looks too dry add a touch more olive oil. Pour your stalk in, give it a good stir and put your lid on your pot. Bring everything to a boil. Zest 1 lemon and add to pot then juice both lemons and pour into the soup. This is when you add a pinch or 2 of baking soda. It seems weird but it’s a trick I use on high acidity dishes. It takes the bite off and helps the acid neutralize into all the other flavors. You still get that bright lemon flavor which makes this soup so tasty but it doesn’t hit your pallet with too much acidity. Lastly, we turn off the heat and gently stir in our spinach. It adds a nice bit of color in contrast to the bright orangey-yellow and the mild flavor goes well with the middle eastern spices. Dish it up and serve with a simple salad and you have a balanced and incredible nutrient dense meal in about 45 mins. The flavors actually improve if you make it and let it sit in the frig overnight so I love packing it for lunches or making it ahead of time for when I have even less time the next day. You can even have it cook during the day while you’re at work by following steps 1-4 and then transferring it to your crock-pot with the remaining ingredients and keeping it on low for about 8 hours. No more sad veggie burgers on nights you don’t feel like cooking. 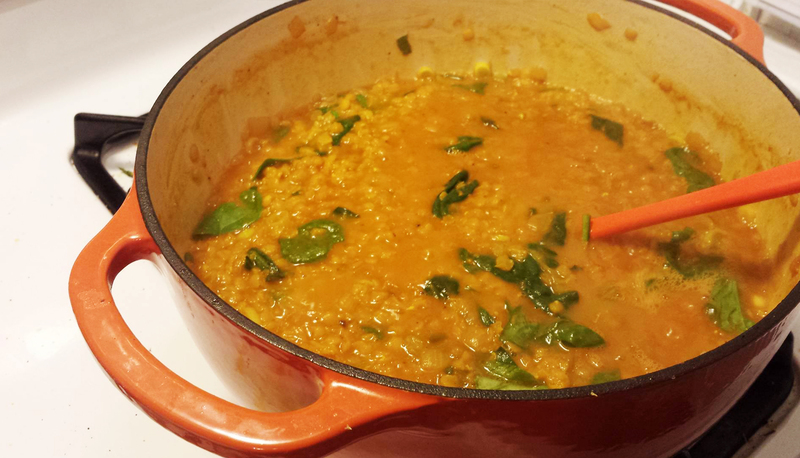 I used the green lentils as I had a lot on hand. Also avoided the hot jalapeno and was very happy with how it turned out. Made only a half recipe, but now wished I made the full recipe that you posted.